Here is a lab discussion between Zama, I and later Omei too from a few days back. Eli: Beautiful collection - big thx! Zama: I'd love to hear everyone's opinion on which are best? Eli: So far I like Dl2007's the best as they are fairly clean and very green. There is one of Mee's looking real good too. I'm basing this solely on color visuals. Zama: What about the last one- Astromon's? One thing I notice is that many of these spirals have a little bit of circularized nature in them. Zama: Can you define or give an example of what you mean? I can't say for sure that the more pure version will do better than the slightly less spirally. Because the best FMN/MS2 aptamer with the best fold change so far for riboswitches, had an almost pure spirally pattern, but with a slight turn in the middle. Zama: Can you give an example of what you call circular? Like this- with it setting on top of a spiral? Zama: I saw tons of those- they are the ones with the multiloops. Were you saying you were seeing a lot of circulars in my collection? Zama: Ah, that's where I got confused- and yes, some are on the border. Ok, here is one - actually one of those I like for their clean look. Zama: Yes, those differ considerably to the kind of spiral we got in round 1- like Jieux's. Notice that stem highlighted in state 1. This is the one giving the change. Normally both moving part in both states of a pure spiral design will look very much the same. They will be two or three switching stems in line. And all that happens is that they swap their partners for different ones between states. Zama: Yea, that's one of those little hairpins in the static neck loop that seem to be tolerated. On the no multiloop observation, the spiral designs behave quite opposite to the circularized designs. The latter seems to make a virtue out of getting multiloops in. Omei: I think the difference between a "pure spiral" and the "almost pure spiral" of the best FMN/MS2 designs is a very significant difference. A pure spiral implies the absence of a multi-loop, and hence only a single hairpin loop. As I recall, one of the first things we measured in the earliest array labs were the number of hairpins in each state, and those with only one hairpin in each state, on the whole, were the worst group. I think it is quite possible that pure spirals will turn out to have good fold changes, perhaps the best, but only if the experiments are done differently, i.e. allow more time to pass between changing conditions, to give the slower full spiral switches time to come to equilibrium. This time factor (which the lab coats refer to as kinetics, as opposed to thermodynamics, is something that Eterna has tended to ignore, largely because the science of RNA kinetics really lags behind that of RNA thermodynamics. At first when I drew it up on paper, I thought it to be a true spiral, but it has a little detour from the spiral pattern in the middle. I have been wondering if we can make a true spiral work in such a lab or if it would need a little longer sequence. Omei: That would probably make it switch even more slowly, making it appear to be worse in the current experiments. Eli: Yes, so a defect added somewhere strategic, while spoiling the pattern a little, may work the best. Omei: I argued for Eterna to explicitly address kinetics questions. Rhiju was interested in talking about it, and came up with medical scenario where it would be important. But there's too many other things going on right now, I think, to introduce that as new types of puzzles. What I do think is possible is to start getting players talking about the significance of switching speed, so we can ask the experimenters to routinely publish the timing of the various steps for each round. If nothing else, that will give us a baseline for comparing results with future experiments that do explicitly treat time as an experimental variable. Correct - a messy arc plot is not a goal in itself. Recently jandersonlee did some calculations over past lab designs that showed that the winning designs tend to have more clean arc plots. I start solving as I can, and as a consequence my plots are regularly messy. You are welcome to clean them up. This one is a near pure spiral, but has a tiny stem forming (aptamer selfturnoff). Benbennet, you are correct that RNA do not make a literal spiral in lab, but in the arc plot. The reason I take interest in spirals in arc plots are that they have turned up in exceptional past lab winners. There seems to be a pattern for the orientation of the spiral in relation to how the puzzle looks. The way the design bends around the turned off aptamer, hints of the orientation of the spiral. In the Tryptophan designs it seems to be the tryptophan aptamer that is strongest and decides the orientation of the spiral. Same for designs with theophylline (at least those labs I have managed to make spirals in so far). Where as for the differently typed Exclusion FMN designs, it appears to be FMN that controls the spiral action. Now this spiral pattern being closely connected with the design bend seems a emerging trend. What I will be very interested in, can you guys make exceptions? designs that bends clockwise, but have the spiral bend counterclockwise? designs that bends counterclockwise but have the spiral bend clockwise? Or is using an FMN exclusion lab cheating a bit? Poll na gColm, thx for testing this out. This makes me realize that I should have added some more advice. So hereby my apology. The switching area in the design needs to have switching stem moving after each other in a line. Small stems in the switching area seems to break the spirally area. Also it is okay to use the FMN exclusion too. That is no cheating. For now it seems it behave in a similar way bespite being an OFF switch and the others are ON switches. And I do give you points for solving the task as I stated it. I didn't specify well enough. A while back I was wondering if the static stem that tended to turn up at specific spots in the switching area in lab designs were having a function. (Background forum post - See the section No static stem) Beyond the more obvious benefit of hiding away excess bases. I got a chance to test this in round 101 where we got 8 sublabs with the FMN/MS2 riboswitches labs that had the aptamer placed such a way that there were no longer space for a static stem in the switching area, as the other labs allowed for. I submitted sequences from earlier winners that did have a static stem, but just with with the sequence from the static stem part excluded. I expected the miniaturized designs to take a score hit. They all did, but one. So generally the static stem did seem to have a function. But that one exception have had me mystified since. I wrote about this design. I can now explain why this particular design managed to escape the score hit dealt by the missing static stem. The static stem deletion caused a style change in the resulting design. Its arc plot is of the spiral kind. I think the spiral designs have a potential for reaching a far higher fold change than the circularized design style. I was watching past lab winners in jandersonlee’s arc plot tool when I stumbled over this arc plot. It was a spiral. I looked up the design and realized that this was the design that had me baffeled from my #StaticStemDeletion experiment. It is from the one design from my static stem deletion experiments that had a better fold change than the original winning design that had the static stem. I toggled the design from state to state and indeed this design a microspiral - a miniaturized spiral design. A shorter train of stems sliding. Watch how it slides. Just like the many recent spiral designs in the open lab. In addition to the spiral arc plot, the design had a curious switch graph. I am wondering if the two curves not meeting at the right end of the graph image, means that the design has not gone through its full switch potential within the time limit. I have found other designs with spiral arc plots that have the same switch graph signature that shares traits with my #StaticStemDeletion - JL SNG1 3.00 18 - variant 3 design. Just to mention Zama's Tryp B SS (MGA) ZZ-1-18 and Jieux's Comedy 1 #all3 #staticstem from the lightning round 1 were also spirals, show the same switch graph behaviour. It’s the same case for the switch graph of ViennaUTC's big spiral that gets the best fold change of all the small loops labs from Round 101. But I find it fascinating that the designs with spiral arc plots also seems so show early tendencies of trending toward getting distinct switch graph curves. The designs with spiral arc plot are different to the designs with circularized arc plots. The round 4 batch from the lightning round had a bunch of working spirals along, in particular in the Tryptophan B Same State (Spinach) lab. Many of the spiral designs (green boxes) had switch graphs where the blue and red line were apart and don't meet at the end (to the right). Just as the switch graphs I pointed out for earlier spiral lab designs. I have added arc plot type to each design. Plus the #SB and #BS reveals the orientation of the spinach aptamer. B stands for big (longest side of the aptamer) and S stands for small (shortest side of the aptamer). That way I can use the same abbreviation for different aptamers. I use these hashtags on my lab designs, as for being able to group the designs after types. So far there have been mainly counterclockwise spirals for the lightning round. The patterns that seems to be there so far is that the Tryptophan B Same State (Spinach) with the best fold change and wide switch graph have in common, are that they are spiral designs + they use a selfturnoff binding for the tryptophan aptamer. Plus the two designs with the best fold change (27.7 and 19.5) + wide switch graph have in common, compared to the other designs, are that they have static stems at one end of both aptamers. If you are into spirals as am I, make sure you try out both clockwise and counterclockwise spirals. Plus try these out in combination with different aptamer orientation. That way we make better sure that we hit on what works best. You said above: Many of the spiral designs (green boxes) had switch graphs where the blue and red line were apart and don't meet at the end (to the right). Just as the switch graphs I pointed out for earlier spiral lab designs. My question is- would the goal be for them to meet on the right? From what I understand, if the designs are tested at a longer time they may. I think Omei and others can explain the details better. From what I see the designs aren't finished switching. They are slow starters and slow finishers. 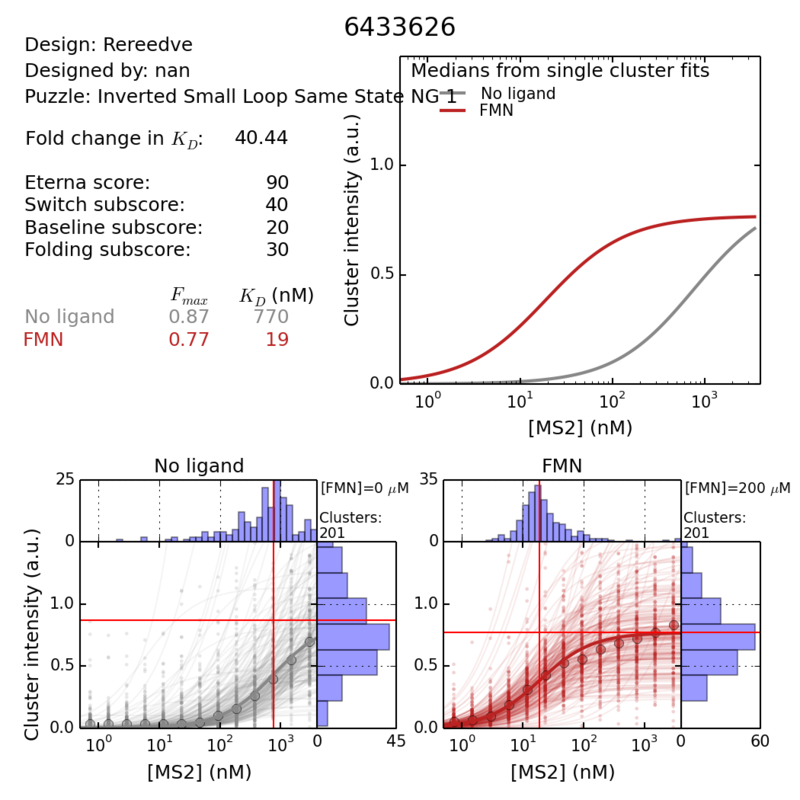 :) Compared to the more typical winners in RNA origami solve style designs with more circularized arc plots. Hi Eli, I'm not seeing the clockwise in this design???? Ok, I think I know what happened. I saw two spirals and since I have a habit of taking one road if I can, I just continued outward counterclockwise after I reached the middle. Normally I go from outside and in when I count what orientation it is. Zama is correct. Both these spirals are clockwise going outside in. Another thing, is that what spiral is in native and in states are not always the same way. Normally I count spiral orientation from states. Now I can't remember any design in particular, but I know I have seen designs where the spiral went one orientation in states and the opposite in natural. Can you guys find examples? those arc plots are messy with faint lines. not good. I have a proposal for voting strategy for Puzzles for lightning round 6, for those of you who are into spirals like me. While I try make a bunch of spirals in each of these 4 categories, I am not asking you to vote for my spirals. Pick whatever spirals you like best. What I'm asking is when you cast your vote for spiral designs, that you try pick one spiral in each of these 4 categories. The reason I ask is that I hope is that we get a complete or near complete set of all 4 spiral types through the voting process. This may help start get an idea what orientation for spirals and MGA aptamers that may be best in these two labs. Which again may help us on what future lab rounds want. Another wish if you use hashtags to signal spirals. I would like to have the spiral orientation first (#CCW or #CW) and then the MGA aptamer orientation (#SB or #BS) after. Then they can be searched out at the same time and isolated together. So eg. #CCW #SB not #SB #CCW. Again. Don't go back and change your previous designs. Just know that adding these hashtags in a fairly similar way will make it easier for us to analyse the data afterwards and drag useful trends faster. Reminder: Eli is reading spiral direction (counterclockwise vs. clockwise) from the outside of the circle inward. I was reading it from the inside out, which would make it just the opposite. Zama showed me an example yesterday. Here it comes. zama: @eli, the counterclockwise design you have in your new Google Doc- looks clockwise to me? eli: The image you show above is clockwise. I count from the outside start of the circle. Google doc with examples of different spiral types. Zama brought up something today that I think will be a helpful perspective on spirals. Hereby I bring part of our discussion. zama: Many of our spirals resemble Fermat's Spirals. I'm curious if there is a way to gauge how close we can get to them? eli: I think it has to with how you fill the loops out inbetween the sliding stems that are creating the spiral. If you make an even number of loop bases on both sides, you will get a straight stem. I have a puzzle demonstrating. zama: @Thanks- and here I've been trying to avoid doing player puzzles lately- lol! eli: In fibonacci spirals the spiral is growing, it isn't equally close all the way. To create a growing spiral you will need to add more single bases in loops on both sides in a growing pattern. you can usually count on mine having something to do with lab. zama: Do you think the Fermat could be duplicated in design? I wondering if the closer a design is to matching the Fermat equation the better the score?? zama: The design of yours that I posted above looks closer to me. eli: Can you give me a link to it? What I mean your fermat spiral image has two intertwined spirals both originating from the center of the sequence. zama: Ok, it looks more like the Fermat image you posted. I like this fermat illustration as the color contrast hightlights the inverted mirroring. Ok, I'm not sure the double spirals are possible in same state labs. Pi's design is an exclusion lab. And there the aptamers have to counter each other. One be on in one state and another be on in another state. Actually there are. They just look a bit different to Pi's exclusion double spiral. They instead get a characteristic snail shape. Here is a good example from a previous post. It is from Dl2007's design with fold ratio 1.13 (from Lightning round 4 results). Watching Dl2007's design, I think the road to making double spirals is to focus on one of the aptamers. Then to pick two spots in this aptamer that can both pair with themselves in one state (1) and then have these two spots bind two places else in state 2, and have those two new partner spots in state 2 perhaps bind somewhere in state 1. While we haven't seen high scores for double spiral designs yet, I would like to see them getting made and also voted for just as the same 4 types that I wish to see single spirals for. @jandersonlee has added batch processing capabilities to his arcplot server, so it has now become realistic to process and evaluate large batches of designs. I've talked it over with some players, and we concur that it is time we start publishing some results to help collaboratively improve players' ability to evaluate designs. Limit your recommendations to no more than 10 per puzzle. Include your rationale for your choices, so other players can learn from your thinking. Depending on how you go about determining your recommendations, this might be a single sentence for each design or a general description of your selection process. Feel free to include a link or links to supporting material and/or to the designs themselves. Don't get hung up on precisely following these guidelines. If for any reason you would like to publish your recommendations anonymously, PM them to me and I will post them here for you. I've also made some mods to some of these to fill in my last few slots. I find there are more submissions in each puzzle than can reasonably be looked at so my approach tends to be a quick eyeballing. I usually just look at all the submissions for a particular individual as this makes things more tractable: and will mostly use Vienna2 and the old browser continuously pressing d to flip through the structures. I keep meaning to look at the arc plot tool but have yet to get around to it. What I look for is something I think of as cleanliness of design (for both states). It's a little hard to define but it tends to mean a pleasing-looking geometric structure with an absence of too many kinks, small bulges and other oddities. Also the two structures must look sufficiently different that there's a reasonable chance of good switching. Other considerations would be a reasonable balance in the nucleotide composition (i.e. more or less a quarter each of AUCG) and retaining the general structure when switching to Vienna or Nupack. 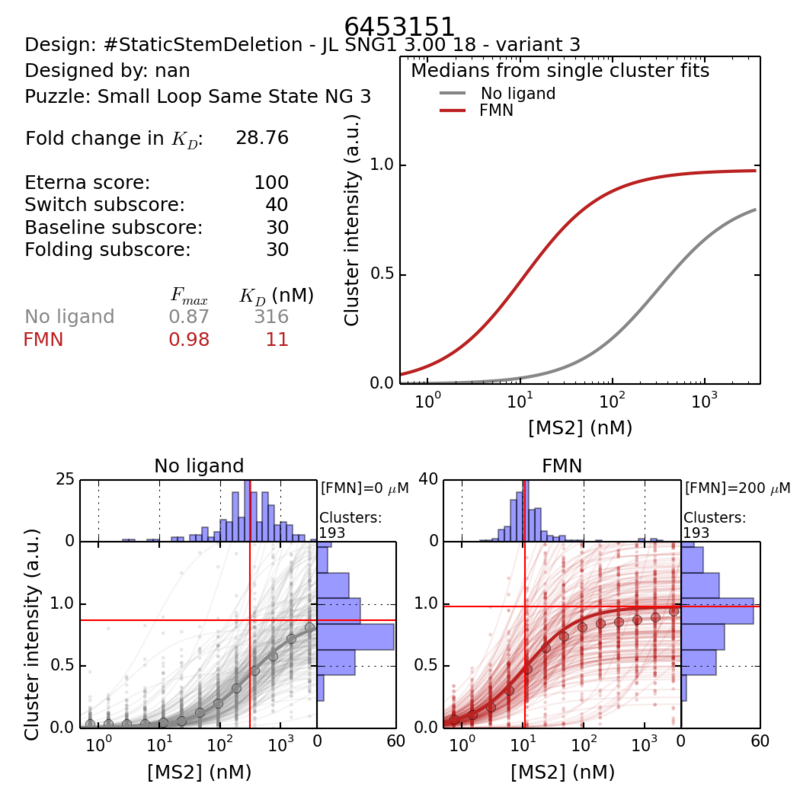 Once again, all have relatively clean, symmetrical dot-plots, a strong, static neck, the aptamer and reporter both show in MFE for state 2, and the metrics are similar to those of prior lab winning designs (R101, R107) except for the seventh one whose d1 is just slightly high. If you average the arc plot pairing percentages for non-static pairs you can get a rough approximation of the experimental Fold Ratio. Perhaps this could be built into the arc plot generator as a way of averaging out the ratios figures given by the generator. Very interesting! In the meantime, now that the arcplot can also output data in .csv format, a column to do this could be added to a spreadsheet. Just tried it and I guess all the information you're using isn't in the .csv. I have been playing with your formula all morning and find that in some cases it comes amazingly close to results but in other cases, it is off considerably- like Jieux's high-scoring Comedy 1 in Round 1. In any case, it made me look a lot closer at how the various numbers impact the results- thank you very much! Hi Zama, the way I did it before wouldn't apply to exclusion puzzles, because what I'm doing is averaging out the results for the probability of one specific structure forming. So what the Folding Ratio from the real life experimental results tells us is the folding ratio of the MGA loop forming in one state and not the other, it doesn't demonstrate anything else, so if you were to apply what I'm doing to Jieux's puzzle, you would look at non-static MGA bonds and apply the following, regardless of any other structure forming. Yes, thank you for the explanation and visual. I knew the off would be different, but now I see where you're getting your numbers. I have used jandersonlee's arc plot tool to filter through all the Theophylline A Same State (MGA) designs submitted so far and used filtering to get rid of most of the designs. Then I got the tool spitting out arc plots and dumped them in a doc. Here are the resulting 144 arc plots. I have left the result of the full search at bottom of the doc. I will use a 3 state spiral puzzle I have made where all 3 states connectedly make a spiral - for illustration. What I imagine is the arc plot as an opened book. Top page is the top arcplot for state 1. Bottom page is the bottom arc plot half for state 2. Turn to next page and one could view an arc plot for state 2 and 3. It could also be 1 and 3. Or one could click an arrow to one of the sides for the page with arc plot for state 1 or 2, so one could swipe out one arc plot state for the next states arc plot. Turn yet a page and one could view state 1 and 3 together. I filtered the so far submitted Tetracycline B Same State (Spinach) designs. Here is a document with arc plots of the resulting designs. Thank you, Eli! The multi-looped tetracycline aptamer with hairpin sure does mix-up the look of things. Np, Zama! I was happy to see that there were even a bunch of spirals among. I have managed to find, mood or make 3 of 4 spiral types. #cw #bs, #cw #sb and #ccw #sb. I haven't managed to find or make #ccw #bs yet. Here is an additional document with a filtered set of designs from the FMN A Exclusion lab. I added stronger filter conditions as I ended up with more than 200 designs after my first filtering. Here are my top picks for Tetracycline B (Spinach), mostly based on clean arcplots, high state 2 percentage/ratio, and low d1/d2. Several successful designs in the Lightning Rounds have an internal loop in the switching section in state 1, so the first two feature internal loops. Here is some analysis in relation to our new results for lightning round 5 that got shared in the news post Lightning round 5 results. Omei was wondering about why the Theophylline B Same State (Spinach) lab went bust, while the Theophylline A Same State (Spinach) lab went great. I think I have an explanation. A or B puzzle type? When there are two partner labs, where the only difference is that the order of the reporter and the aptamer have position swapped for each other, then one of these partner labs tend to do a lot better than the other. There is an optimal order of aptamer and reporter in relation to each other. In the R107 lab Single-input switches, revisited we had a lab round that looked at the MS2 reporter against a bunch of aptamers that were mostly new to us. The aptamers were Tryptophan, Theophylline and Argenine. That lab too introduced the puzzle type naming A or B - in relation to if the MS2 sat outside of the aptamer. (A type) or if the MS2 sat between in between a split version of the aptamer. Earlier we also had the R101 lab FMN/MS2 Riboswitch Structure. Those puzzle types weren't named A and B type. But what pattern has showed itself in relation to MS2 so far is that the B puzzle type generally has performed better than the A type. The pattern has been present from the earliest FMN/MS2 switches. So Aptamer-MS2-Aptamer labs tends to go better than MS2-Aptamer-Aptamer. The numbers 1 or 2 over the middle aptamer section signify if the aptamer is in one whole piece or if it is split. The behaviour column where I have put MS2 equivalent to different aptamers, I'm basically stating which aptamer that takes the strongest aptamer spot, where MS2 would normally like to be if it was a part of a riboswitch. However now we are trying a bunch of relatively new aptamers to us, plus some new reporters. For these new aptamers I have mentioned that we still don't know which of them are strongest. As opposed to eg MS2 and FMN. In past labs MS2 has been pretty strong and rather stuborn, so that it took a good bunch of bases to make it turnoff. I have expected the stronger aptamer/reporter to take the spot of MS2 - in the middle between the sequences of the other aptamer. If we are to do more lightning round labs before the full lab round, then I propose Theophylline A Same State (MGA) as candidate as I expect it to do well. Provided that it is possible to make the partner tetracycline lab, I excect based on the result so far, that it should do better than the one we have done. Basically I wish that we have a full set of partner labs for all the labs we have been working with so far. I have noted that the two great designs, the one by Astromon and the one by JR both follow previous lab trends. JR's good design is of the circularized arc plot kind - in this case looking like a clown mouth in natural view. It is if the symmetric RNA origami style - making a switching movement typical of the majority of past winners. Plus both aptamers have static ends. Weird enough this circularized design has a similar switch graph as the spirals generally seem to have. Astromon's good design is of the spiralized arc plot kind. It has an aptamerselfturnoff for the theophylline aptamer. Plus just as the 2 best designs in Tryptophan B Same state Spinach both of it's aptamers have one static end. I have a couple notes to add. Neither of these two winners forms the same shape in all three engines, whereas I've noticed our best winners hold their shape fairly consistently across all three engines. I've noticed this is fairly rare in my limited experience. All our Lighting Round winners have at least one loop in state 1. Even if the loop is small, perhaps the unpaired bases provide a weak spot where the molecule can separate to fold into state 2. And static stems work once again. I'm guessing these add stability to the shape and provide a foundation for each aptamer so that the aptamers don't have to form completely out of nowhere. Sorry if I'm repeating the obvious. Feel free to fill me in! DigitalEmbrace, thx for your notes. "And static stems work once again. I'm guessing these add stability to the shape and provide a foundation for each aptamer so that the aptamers don't have to form completely out of nowhere." I think this is exactly why. Keep an eye for a continuation of your 1 loop in state 1 idea. Do this loop turn up somewhere specific? What I'm wondering is if there is any pattern? Recently I made a prediction for the few labs that we still hadn't done lightning rounds in from the Lighting Up Dark Cell's round. Theophylline A MGA had good difference between the blue and red curves in several switch graphs. Tryptophan A MGA had only really minor difference between the blue and red curves in some of the switch graphs. While the scoring scheme for the new switch graphs is still in the making and things as such are not set in stone yet, there are still things that can help us with deciphering the switch graphs. Omei was answering switch graph reading questions. Looking over the lightning round results, I noticed that on the whole, we have done considerably better with the Spinach aptamer than the MGA one. So I looked over some of the better MGA designs, like this one from the first round (Jieux's Comedy 1 #all3) to see if there was anything in common among those that did switch. A quick check showed that this particular choice of pairs was not that common, and I wondered if there might be something in the scientific literature that could account for how an AU pair here could influence the binding. I found three experimental papers about the aptamer. It turns out that the bulk of the experimental data has been done on this hairpin sequence, with minor variations. The three dimensional structure of this aptamer binding to the malachite green molecule has been determined, and it is very unusual. The bound aptamer is stabilized by two base triples and one base quadruple. The first three panes of the diagram below mark the bases involved in these structures. Furthermore, the AUA triple has been shown to be very important for the stability of the binding pocket. Reducing the triple to a normal Watcon-Crick pair by mutating base A26 (A27) reduces the binding energy of the aptamer by 2.5 to 3 kcal, essentially eliminating its affinity. Unfortunately, the question of most importance to us (should be always design with the AU pairing at this position, or are others just as good?) isn't specifically addressed in the scientific literature. There is a possibility that pairs other than the AU can form the same, or similar, triples. But the lightning rounds have given us results on 42 MGA designs that we can compare. Those results suggest that the AU pair is an especially good choice. Because there are differences among the rounds, there doesn't seem to be a unique way to make the comparison, but here is an obvious one. Of the 42 MGA designs, only seven (17%) have used an AU pair in the same orientation as above. But of the six best fold ratios (> 2.6), four (67%) have used the AU pair. I intend to follow up on this over the next day or two, but I wanted to post this much now. The current lightning round is using MGA. and it seems that the choice of bases at this position should be a significant factor in both designing and voting. This illustrates what seems to be a limitation in eterna: the inability of the engines to look beyond standard Watson-Crick base pairing and examine all the more exotic forms of hydrogen bonding that you might see in a full 3D structure (Hoogsteen base pairing, triple and quadruple base pairing, bonding to the ribose, etc. ). Not suggesting I have an answer for this but half the time the engines can't even agree on the secondary structure so the prospect of evaluating the full tertiary structure is remote indeed. Following up on the above, I categorized each of the designs tested so far that used the MGA aptamer by the next-to-closing base pairs, i,e, 11 and 22 in the above screen shots. But before showing that table, I want to clarify what I mean by an AU pair vs a UA pair. The pair I am always referring to is the next-to-closing pair of the bigger aptamer loop -- bases 10 and 70 on the left and bases 59 and 27 on the right. (Regardless of the orientation of the aptamer, the stem base next to the closing G will always have a number one less than the G and the stem base next to the closing C will have a number one more than the C .) When I categorise a pair, I will put the base next to the G first. Thus, the next-to-closing pair in the design on the left is AU. On the right, it is UA. For the purpose of calculating a summary statistic for a group of designs, one can't meaningfully average fold ratios. But the fold ratio can be converted to an energy value (called ddG) by taking its logarithm, and it is appropriate to average energy values. This indicates that in the designs tested so far, the AU pair retains its advantage over others when considering all the designs, good or bad. As far as interpreting the significance of the ddG values, the difference between the ddG values for AU and UA (0.7) corresponds to slightly more than a doubling of the fold change. In a comment to the latest news post, spvincent asked "Is the MGA loop sequence cast in stone or is there any flexibility that could be exploited? Make binding a little weaker perhaps." I'm going to respond here because it is easier to include images. The short answer is yes, this question has been studied. The following table is from the journal article Recognition of Planar and Nonplanar Ligands in the Malachite Green–RNA Aptamer Complex. The first column ("Wild type") refers to the sequence shown in the second image. The right-most column shows how much the given mutation weakens the binding energy. For the record, this experimental data was determined using not malachite green as the molecule, but a closely related one, tetramethylrosamine (TMR) for technical details. The article discusses why this was done and why it shouldn't make much difference, but I didn't even attempt to understand it. Article's results were not derived from a "switch" environment ( as far as I can tell ) so results between it and us may be different so I wouldn't follow the article's recipe to a tee. Another something interesting comparison to study when we have the results at our disposal. So how did the spirals do? What is the benefit of spirals? Where have the spirals shown up? Spirals as top dog in labs that were hard to solve. We have now had 8 lightning rounds getting feedback on lab designs. Michael made this real fine image (below) with overview of how well the individual lab designs switched, also in related to the expected max score. 2 of these 3 unexpected high jumpers were spiral designs. The first set of aptamers we worked with for riboswitches FMN and MS2 had the immediate advantage, that they had sequences that were a perfect match for a direct pair up between the aptamers, meaning that one could make same state switch where the aptamers turned each other off directly. Similarly both FMN and MS2 had a shared sequence, which was perfect for using a shared sequence between them in exclusion puzzles, so the shared sequence could take turns with turning either the FMN or the MS2 off. However many of our newer aptamers do not have the same shared sequence or directly complementary stretches. The beauty of spirals is that they can work no matter if the aptamers are capable of matching directly or not. What the spirals actually do is to allow an indirect pair up between aptamers that may not be able to pair up directly, like FMN and MS2. Many of the designs with spiral arc plots, tend to have a special kind of switch graph, like the design has not yet finished switching and reach its maximum capacity for switching. Aptamer self turnoffs - which are aptamers turning themselves off by pairing with their own sequence, just binding in a different manner to when they bind their molecule. Aptamer self turnoffs can themselves sometimes create spirals. This happens eg. with some tryptophan solves. Both the theophylline and tryptophan aptamer are heavily involved in aptamer self turnoffs and in causing spiralling. Zama’s TRYP B SS (MGA) ZZ-1-18 from the Tryptophan B Same State (MGA) lab that was one of the 3 switches to exceed the expected maximum ratio, is both a spiral and has its tryptophan aptamer involved in self turnoff. Cynwulf’s Set 2 Design 001 from the Tryptophan B Same State (Spinach) lab that was the other high jumping spiral design, also uses tryptophan aptamer self turnoff. I was testing if a static stem really was necessary in FMN/MS2 designs, by deleting static stems in already successful designs and I expected these designs to fail. One of these designs however did better than the original design with the static stem and this exact design had a spiral arc plot. Otherwise the static stems were beneficial to designs that holds circularized arc plots. Spiral designs can still benefit from static stems, however they prefer them somewhere different. Namely at their one aptamer end. Static stem deletions to more regular circularized designs, may create spiral designs. While we have made spirals work without giving both aptamers one static end, I find it worth to highlight that the two spirals that exceeded the maximum ratio, both had two static aptamer ends. Spirals make allowance for bigger switches - and bigger fold change. This gets around the problem with too long stems that may arise that can kill a switch. Because designs with circular arc plot tends to have stems. The longer stems get the less switchy they get. So there may be a limit to how big circularized switches can be. Switches with spirally arc plots can consists of several but smaller stems that are lining up as a train. They have the two sequences between their aptamers switch in parallel and a antiparallel movement. Whereas designs with circularized arc plots switch in a perpendicular manner. While designs with spiral arc plots tends to be longer than designs with circular arc plots and as such uses more bases, there are still only are a limited number of ways one can make a spiral. Because the definition of a spiral is a bend in a specific direction. Plus the arc plot has to cross the line between states. So knowing that a spiral design can solve a design task, limits the space of possible solutions. The spirals can be adjusted in length to fit the amount of bases one is given. A spiral can involve a direct complement to either 1 or both of the aptamers. As jandersonlee said: If you can 'roll' (or unzip/rezip) the base pair like this you don't have to break all the bases to change states. If the aptamer bases can switch first, they can perhaps free whatever blockage is preventing the reporter site from forming. One thing that designs with cirularized arc plots have in common with the designs with spiral arc plots are that many of the same bases that are involved in base pairing in state 1 is also involved directly in base pairing in state 2 - just somewhere different. Arcplot from Zama’s maximum ratio high jumper design. Notice how all the bases marked with blue are connected in both state 1 and 2 at least one time. While the RNA can physically make what the spiral pairing up that is suggested with a spiral arc plot, the arc plot shows the potential for dual states. The yet unfolded individual RNA bases are in a mixture of states - quantum state. With an option of being bound two different places. Although not at once. Not even can bases have two home states, groups of bases can move in concert and just as a single base can have two homes, so can groups of bases. Dependency chains as jandersonlee calls them. Spirals are basically a way of getting a maximum of bases involved in base pairing (of the switching kind) in both states. A lot of the hard labs that did not have winners, had some of their topscorers show partial spiral behaviour. Thx to Zama for catching some of my mistakes. I alone bear responsibility for the rest. First a big thx to Zama for questions and discussion. Also thx to Omei for listening to my first rambling on double bachelor’s dilemma in spirals. She asked for visuals. She got a point, so here we go. There really are a lot of circulars in a lot of arc plots, also the bad ones. But these arc plots tends to be a lot more irregular and swirly as Rhiju calls them. They also tends to get really long. Which is okay if they are spirals, but not if they are not. But Zama have a point of spirals having something really circular to them. They are moving in shrinking or growing circular movements. Circularized arc plots and spiral arc plots have something else in common. I have actually seen an arc plot for a design do something like this, although I forgot which. Eli: Yup. Notice what the road do. It moves directly through all the aptamer parts. Design as shown in game, with the aptamer sequences highlighted. Spiral arc plots takes detours, although in a systematic manner. 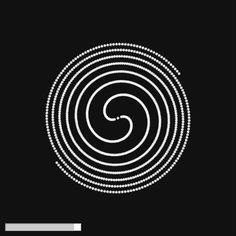 Here is a winning spiral design (by Pi). Here the road track goes a lot different. It goes from the theophylline aptamer, to a non aptamer area which again hooks up with the other aptamer (MS2). This is an indirect pairing. I have been thinking about spirals kind of like being a double bachelor's dilemma in one puzzle. It isn't always the two aptamers can share a common sequence like here. But then if one can't hit the other aptamer in the third step, then one can aim for the aptamer gate instead. The aptamer gate can have its sequence changed to what is needed, unlike aptamers. So one can always make a fit between two aptamers, by using sequence in between. Just like in the bachelor’s dilemma. So basically the spirals either as single or double spirals works as bachelor’s dilemma. But there can be more than one inbetween sequence. But also fewer steps. The amount of strands between the two aptamers can vary. Depending on need. One can even make a spiral so short that one makes only a complementary sequence to one of the aptamers. So the main difference between designs with true circularized arc plots is that the circularised arc plots take the shortest route through all the aptamers (or really near them), whereas the spirals takes a longer and more indirect route. The later also through none aptamer or aptamer gate areas. Spirals uses the indirect route to create complementarity between the aptamers, where as circularized designs do a direct pair up between the aptamers and or their aptamer gates. The circularized designs depends more on short range interaction. Circularized designs do a more jumping move. Aptamers in spiral designs can be further apart. Zama: So it's not that one is better than the other but what fits the design??? Eli: What fits the task. How long is the sequence. Is the aptamers fixed somewhere. Etc. And if one want to make a switch that is likely to work with fewer tries, then one goes for a circularized design. It generally uses much fewer bases and as is easier to make. However if one wants not just a winner, but a real high fold change, one should consider making spirals. Despite fewer of them are going to work and they are a bit harder to make. Because more bases, so more things can go wrong. Zama: Which brings me back to the Round 5 comparison between Astro and JR's. One spiral and one clown.- The opposite of what you just said though. Eli: Ok, I got what you are saying and you are right. The circularized designs is the best. For now. I think the spirals have the potential to best circularized designs in the future. Because I have seen it happen in a few of the past labs. Eli: So I had the mouth a bit too full and not saying that I was in prediction mode not exact fact mode. I sometimes forget. Zama: I think the reason these two scored so well is because the spinach was about as far away from the aptamer as possible- on both. My hypothesis. Most of JR's reasons in his post didn't hold true in Astros. Eli: This is a good observation. This also expand the space of the fold. It is generally helpful for same state designs. I would say the design by Astromon - Astro_modly_mod3 does meet the criteria in my independent post. The design starts with a static stem, followed by the spinach aptamer, followed by the folding area, followed by the molecule aptamer , and finishes with another static stem. In this design the folding area slides or shifts the design to switch between states. http://prntscr.com/lqdcyi , you might have mine confused with someone else? What you state is true, but I was trying to point to the quandary that it didn't meet all of the same criteria as yours and had a different style of arcplot, but the results graphs were still amazingly similar. Of your six points listed, he matched only 2 or 3. I thought it was interesting and was looking for other explanations for the very similar results. Both being so far from the aptamer was a similarity. @eli i have a question, that thing you predict which labs will do well (A vs B) will that spill over into the new labs? eli: @Astromon, yes. I expect this to also hold for the new labs. One of the types will do worse than the other. Because aptamers have personalities. They are not equally happy about being hugged and held in between another aptamer sequence. The way I predicted for the A and B type labs last time was that I already knew how one of them had done. If the A type has already worked well, then it was easy to say that that the B lab would fluke or the reverse. This has held for previous riboswitch labs. This round however we are having a new aptamer (ATP) that we have not worked with before. Also I do not have any of the partner labs to give a tip on which lab. However I have decided to give it a try anyway, but gone entirely differently about it. NB, there is one of the Exclusion Spinach labs, which seem to be only solvable when the aptamers are entangled.